Fortunate for me, my best friend since college has a work conference in NYC every year. I take the Long Island Railroad into Manhattan and we get to spend some quality time catching up over dinner. This past May, before Toni headed back home, we manage to squeeze in some sightseeing. (Read more about my trip on my past post, A few days in NYC.) We ventured on the subway downtime to Washington Square. I always see people posting from there and I wanted to go see it for myself. The park was semi-crowded because the sun was finally shining! (NO RAIN!) We walked around, checked out the fountain and then headed over to Union Square. Another pretty gem of a park tucked in the busy streets of Manhattan. The day continued with us stopping a few other places, grabbing lunch, meeting up with other college friends, before Toni going to Penn Station to catch her train. As you can see from the Being a Tourist Scrapbook Page, I tried to highlight the special sights we saw. My advice, take a lot of pictures. My iPhone storage is slowly filling up (well maybe quickly) because I can’t seem to take one picture of something and move on. Instead, I need to take 4 or more! How do I choose which picture to display? I often print out a bunch by sending them to CVS through Shutterfly. I choose about 20 pictures depending on the event. I would rather have more to work with than not have enough to complete my pages. As I look through the pictures, I place them in time order. It helps me sort my thoughts and actually helps with placement because I tend to keep everything in “time order.” It is not necessary or the rule, I am comfortable with this process. Once I have narrowed down my pictures, I pick the snapshots that appeal to my eye. (I had so many from this day!) Don’t worry if you think you have too many pictures. It will all come together to make a wonderful keepsake. I am often asked, “Where do you get your ideas?” In the beginning, I used to subscribe to Creative Keepsakes. It helped me see what a layout was, how to arrange, how to place, how to embellish, how to complete the story. I sometimes sketch (rough) a concept or I may even CASE a card of mine and expand into a scrapbook layout. Pinterest is a HUGE resource tool. I look there for inspiration. I don’t necessarily CASE someone exactly. I will tweak it to my style. The best thing to do, just start! Grab your 2 pieces of 12×12 and scatter your pictures. For the “Being a Tourist” double page layout, my pictures were big. I knew I would not have much card stock showing once I placed my pictures. As you can see, many are only trimmed. I prefer this style because I want to showcase as many pictures as I can on a layout without overkill. Once my pictures are placed (not necessarily attached) I begin to fill in the gaps. I look for a stamp set where I can make my own design to incorporate the color combinations I am using with the card stock. 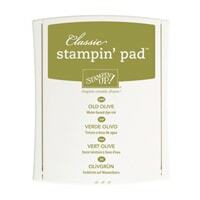 With it retiring, Layered Letters was a must use stamp set. I love the font and I love the title to my page. I have lived on Long Island pretty much my whole life and I still am amazed every time I head to NYC. It worked perfectly for my title. 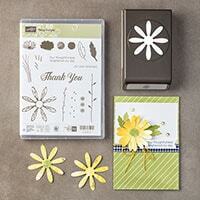 Next, I chose the NEW Daisy Delight Stamp Set. I have used the large flower for other cards, but wanted to use the other stamps in the set. I created the simple 3 1/2″ x 3 1/2″ square and mounted it to a 3 3/4 x 3 3/4″ solid card stock gives my page a stamping element. Having another gap on my left page, I chose the Eastern Beauty Stamp Set to help create a generic pattern element tying in my colors. 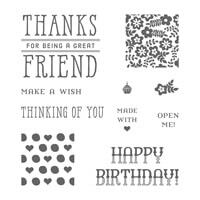 The saying from Window Shopping Stamp Set was fitting to my page since I am thankful for Toni’s friendship. Did you notice the I “heart” NY? 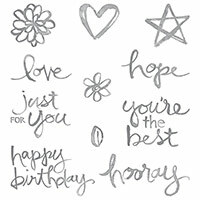 It is from the Watercolor Words stamp set. 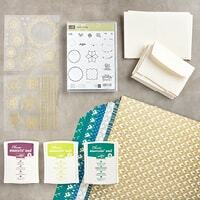 I tied in the alphabet, Daisy Delight and Eastern Beauty stamp sets on both pages. It uniforms my project. I don’t often scrapbook without having my pictures selected. To me, if I am scrapbooking and sharing, pictures need to be placed. For my customers, this is helpful for their placement. If they see my arrangement, they tend to follow it. I hope you found my thoughts on creating a page helpful. The best thing you can do is not stress . Keep your designs simple. Keep them easy to duplicate. 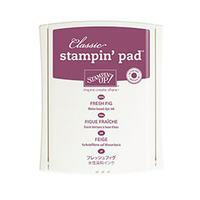 Have a favorite stamp set, use it! Pick an event, birthday, holiday, back to school, summer. Scrapbook YOU!!! Don’t be afraid to do pages for YOU! Once you start playing with the products, your ideas will flow together. I created this page from last summer highlight a fun day with friends! I love reliving my happy days! What a wonderful time of year! 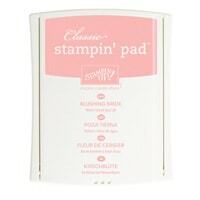 Enjoy looking through the pages and seeing all the amazing products Stampin’ Up! has packed into it’s new catalog.